Our Community Outreach program is intended to raise awareness to the issues of animal welfare in our state, and nationally. 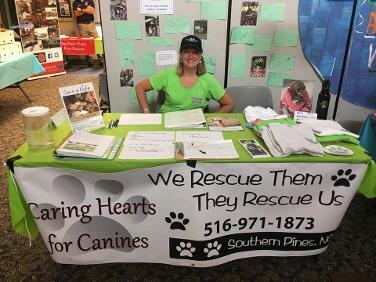 Caring Hearts has spoken in classrooms about animal care, as well as neutered and spayed local dogs in the community where finances were low. CHFC also has a presence at many local events where we not only provide information about adoptable dogs, but provide information how residents can help with the heartworm epidemic and how to mitigate the amount of stray dogs who are often euthanized in local shelters. If you would like more information about our Community Outreach program, contact us!